Scores of excited Ekurhuleni West TVET College students, braved the cold weather to gather at the College’s Germiston Campus for a Recruitment Day. The event was organised by the College’s Business Unit responsible for linking former students with employment opportunities, in both the public and private sectors. The Recruitment Day held on 10 July, was attended by former students from across all six campuses. 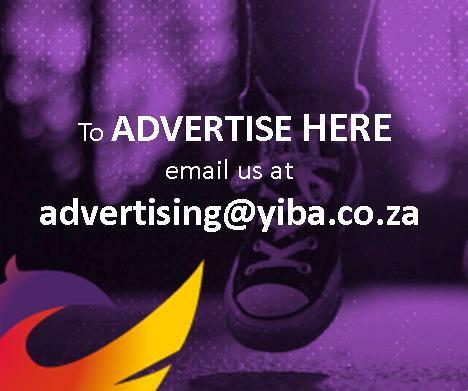 Youth job placement organisations such as Jumpstart, the NYDA, Lulaway, ProServe, Harambe and The Department of Labour, collected Curriculum Vitaes as part of the learnerships and internships recruitment drive. This initiative is in line with The Department of Higher Education and Training motto of ‘turning every workplace into a training space’. Organisations presented Work Based Experience opportunities which are available across various sectors to the hundreds of attendees. 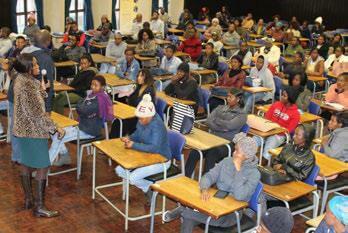 The emphasis was on encouraging students to aim for personal career growth paths when granted a chance of employment. Deputy Principal: Academic Affairs, Mr Nyelisani Mudau, opened the programme with words of wisdom. Mr Mudau referred to the students as the fortunate generation. This, as opportunities are brought directly to them in many ways. He said it is up to former students to ensure that they grab every opportunity presented to them. He illustrated the point quoting the analogy of a horse through the idiom: “You can take a horse to water, but you cannot make it drink”. Deputy Principal Mudau advised those in attendance to avoid accumulating debts during internship tenures as that would defeat the purpose of development and training. Jump-start Training Officer, Alumnus Cindy Mbalo, is a Human Resource Management graduate from the Germiston Campus. Cindy shared her personal growth story with the audience which was about taking a first step to employment. She began her career journey in retail with the Foschini Group as an intern. This was until she was given an opportunity with Jump-start as a trainer. This story was related to inspire confidence amongst job seekers. Job seekers should not only apply for jobs for which they have studied, especially on entry level. Those with successful applications participating in the Youth Employment Organisation, will be placed at different workplaces. The objective will mostly be one of gaining work experience and not the earning of stipends. Career Development offered at these entities consist of amongst other things, Life Skills Training, Job Hunting Skills, Networking, Self-Presentation, and tailoring a Curriculum Vitae, just to mention a few. Ekurhuleni West TVET College was represented by Phanuel Chauke at the event. He enticed former students to participate in an envisioned Alumni programme. He outlined the importance of participating in the College’s activities and of contributing where possible.